New snow that fell over the weekend will be obliterated in the next few days. Record-breaking warmth is expected Wednesday. The snow that fell over the weekend will be obliterated over the next few days. Record-breaking warmth is expected Wednesday. 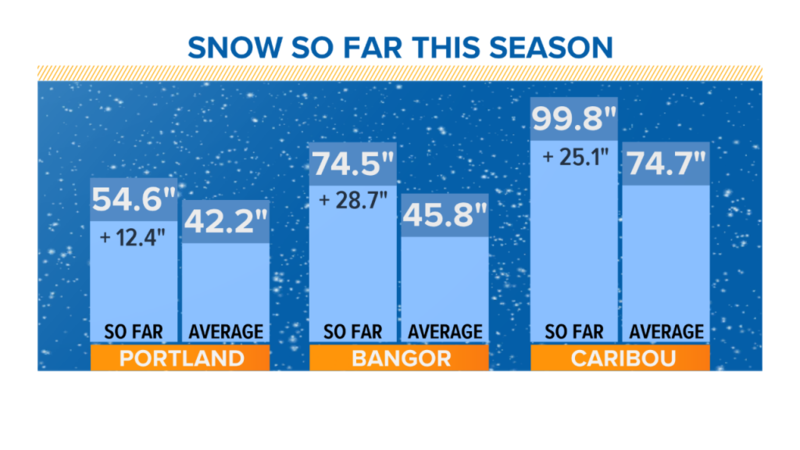 Through this date, Portland has had over a foot of snow above the average and Bangor is over 2 feet above average. In fact, Bangor has already surpassed the seasonal average of 66.1 inches. Portland’s seasonal average is 61.9 inches; we’re only 6 inches off from that. The big weather story this week is the East Coast warmth. A “Bermuda high,” more typical of July or August, will become established Tuesday and Wednesday. If I knew no better and glanced at the East Coast on the map below, I’d think it is mid-summer. This kind of a pattern produces our hottest summer days. It would translate to 90s and low 100s in the Northeast. 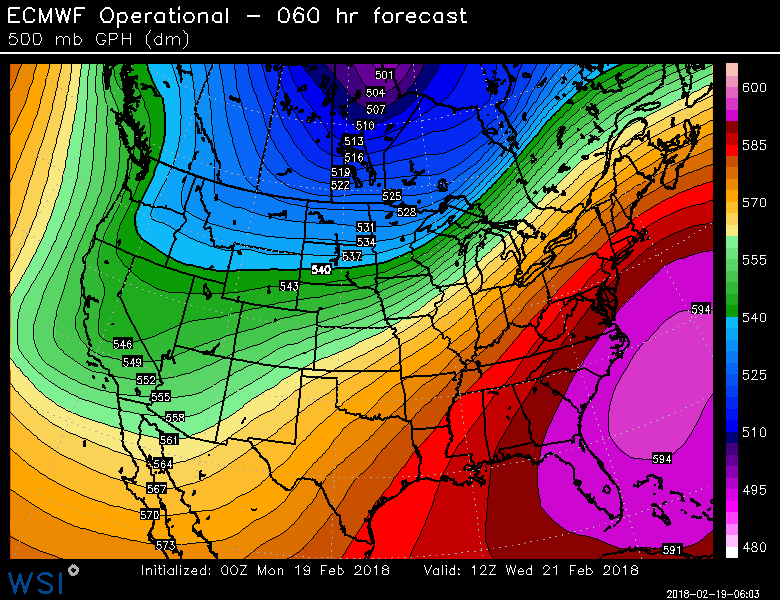 In February, this type of a pattern translates to record warmth. Not only are daily records possible; the highest temperatures recorded in the month of February are in jeopardy. 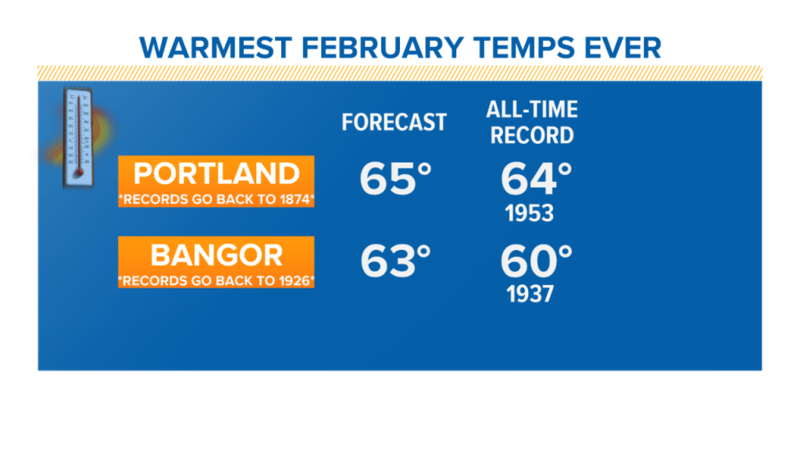 Portland’s all-time record high for February is 64 degrees, set in 1963. Bangor’s is 60 degrees, set in 1937. 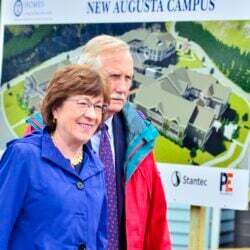 It is always a process to move warmth into New England in the winter and spring. Warm fronts slow down as they approach us, and they come with clouds and showers. Tuesday will be no different. Expect a cloudy, damp day with off-and-on showers. Warmth will be on our doorstep. 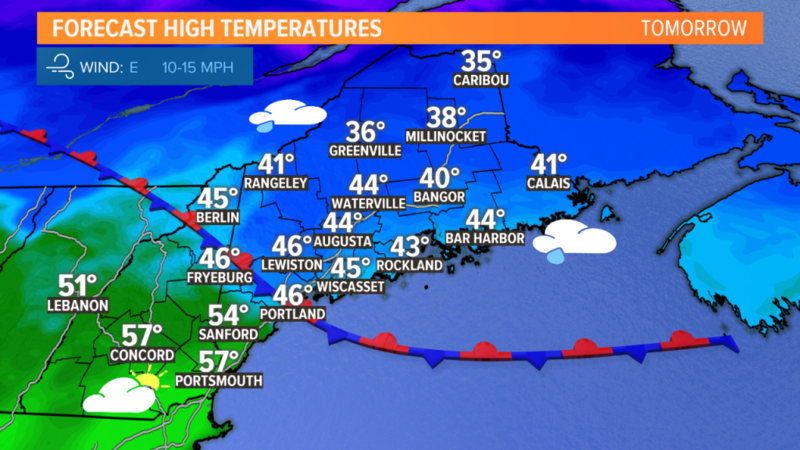 Temperatures will range from the 30s in eastern Maine to over 50 degrees in York County. The warm front blasts through on Wednesday. After early fog and clouds, a southwesterly wind develops and transports the warmth through the state. Breaks of sunshine will pop temperatures into the 60s. 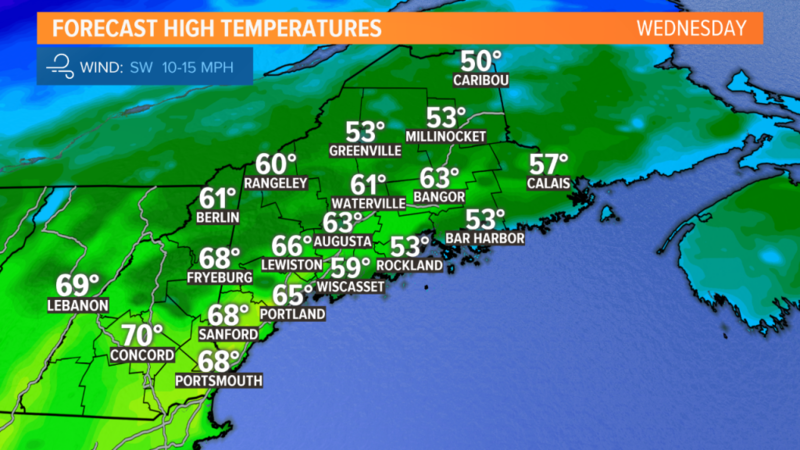 Parts of western Maine could hit 70 degrees! Midcoast and Down East will be cooler, which is typical in this kind of a spring pattern, as the southwest wind flows off the cold ocean. Even here, highs should top 50 degrees, far above the average. After all, it is still February. Spring is not here yet. Cooler air will return and more snow chances exist heading into March.